We are a full-time life-support system to Lottie, a 5 year old fawn/white rescue Shih Tzu from Dogs Trust. Previously, we had Harvey, another Shih Tzu, for 9 years, sadly we lost him in 2011; and we have just said goodbye to Alfie, a Shih Tzu/Maltese cross who came to us a rescue in 2008 and was about 18 when he passed away. 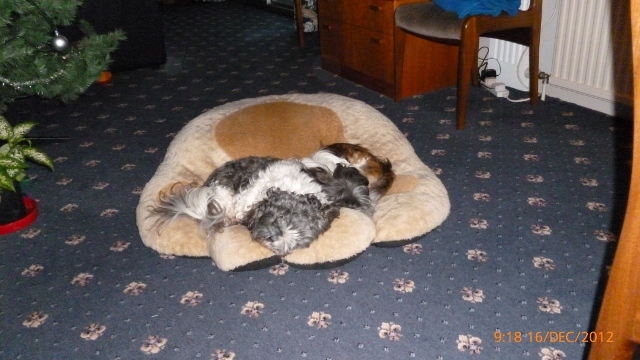 Now, we are looking to offer a forever home to another adult Shih Tzu, preferably a rescue. We know the breed, and health and/or behaviour problems are not an issue to us. Hi, and welcome to the forum! Lovely to hear that you are rehomers. I wish i had a big place to rehome these loveable dogs. Hope u find a shih tzu soon! hi and welcome from me and ruby too. Hello, you do wonderful work with these rescue doggies. Hope you find another one soon! I would echo that. They are a wonderful breed. I have only had my two girls for 5 1/2 years and 3 years but the joy they have brought to this house is amazing. I couldn't imagine life without them. I have had dogs all my life, mostly Golden Retrievers and I cannot remember having the same amount of affection for those as I do for this breed. And the respect they have for each other is wonderful. Hi Jonathan and Louise, and welcome to Whispers, it's great to have you here. We are a very friendly group of shih tzu addicts, so you will soon feel very much at home here. I hope you manage to find another little shih tzu to love, it is lovely when people want to take on a rescue dog. They sometimes have very sad tales, but still have plenty of love to give and settle very well into new families. ... didn't we talk to you last week or am I having deja vu?? ?